We are delighted to market for sale this well proportioned three bedroomed semi detached property, situated in a sought after location with High Lane village and its facilities within easy reach. Requiring some updating this property offers excellent potential for a family home. 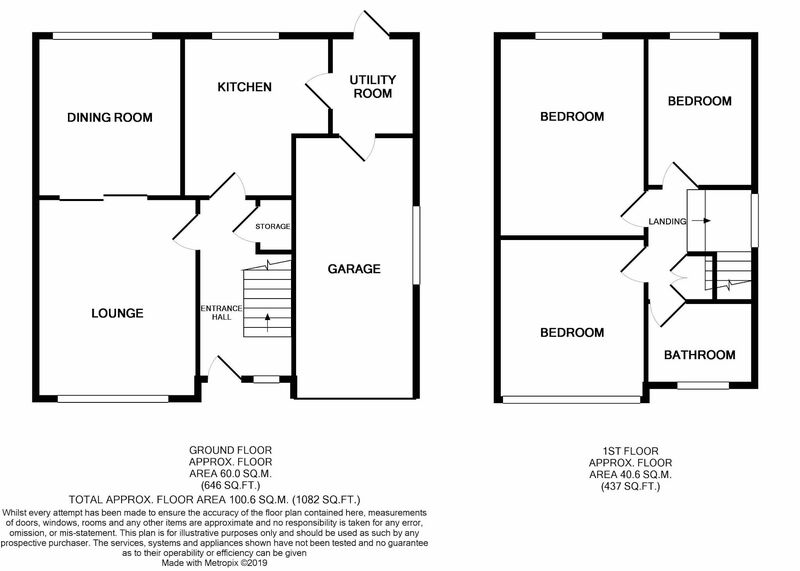 Comprising: entrance hallway, living room, dining room, fitted kitchen, utility, three first floor bedrooms and a bathroom with white suite. Integral garage, driveway and lawned gardens to front and rear. uPVC double glazed entrance door leading to hallway. Radiator, stairs to first floor, coving to ceiling, power points, understair cupboard. uPVC double glazed window to front aspect, wall mounted gas fire, radiator, TV aerial point, coving to ceiling, wall light points, glazed folding doors leading to dining room, power points. uPVC double glazed window to rear aspect, radiator, coving to ceiling, power points. uPVC double glazed window to rear aspect, range of fitted wall and base units, worksurfaces incorporating stainless steel sink and drainer, 4 ring gas hob, built in eye-level electric oven. Tiled splashbacks, door to utility room, power points. with tiled floor, uPVC door leading to garden area, floor mounted gas central heating boiler, space for automatic washing machine, timber door to integral garage, power points. uPVC double glazed window to side aspect, access to loft void, storage cupboard housing cold water tank. uPVC double glazed window to rear aspect, radiator, power points. uPVC double glazed window to front aspect, range of built-in wardrobes to one wall, wall light point, radiator, power points. uPVC double glazed window to rear aspect, fitted double wardrobe, radiator, wall light point, power points. uPVC double glazed window to front and side aspects, white fitted suite comprising, bath with shower over, pedestal hand wash basin, W.C. Half tiled walls, chrome heated towel rail. The rear garden is mainly laid to lawn with planted borders, enclosed by fencing and shrubs. The front is also laid to lawn witha hardstanding driveway, low brick wall to front and with fencing to sides. Viewings are strictly by appointment with Ian Tonge Property Services, 150 Buxton Road, High lane, Stockport, SK6 8EA. Telephone 01663 762677. From our office in High Lane, continue in the direction of Hazel Grove, turning right at The Horseshoe Inn, then right onto Windermere Road, then left onto Grasmere Crescent where the property can be found on the right hand side. Ian Tonge Property Services give notice that these particulars, whilst believed to be accurate, are set out as a general outline only for guidance and do not constitute any part of an offer or contract - intending purchasers or tenants should bot rely on them as statements or representations of fact, but must satisfy themselves by inspection or otherwise as to their accuracy. No person in the employment of Ian Tonge Property Services has the authority to make of give representations or warranty in relation to the property.